However, I did manage a sneaky trip into Harrogate on Wednesday and managed to pick up some surprising bargains. I've not been a massive fan of Crew Clothing of late, I think it can be the sort of shop where things look good before they've been washed, then end up like limp rags. However I spotted this sailor type top the other day, and I have to say it looks amazing - great with jeans and quite "structured" which means it doesn't end up looking like it's hanging off my shoulders. The square neck line is also great for me as I have quite narrow shoulders - here it is, the Crew Olivia Top £20. Although the 10 fitted fine, I am trying to go for comfort over style a bit at the moment, so I got the 12 so there was a bit of give when I sit down. I must be getting old. Who knew that Harrogate has a Whistles! Yes, in fact it has an LK Bennett, Jigsaw, Joules, Space NK amongst many others - though every one of those "posh" shops was deserted although H & M was packed out. Seems that posh people love bargains too. Anyway, I took advantage of the lack of customers to have a good root around in the Whistles sale, and came across the holy grail - high quality black skinny jeans in my size for - £28.50! I am wearing them now, they are beautiful. There aren't many sizes left online, and they also look better in real life - less of a grey tinge and more opaque. 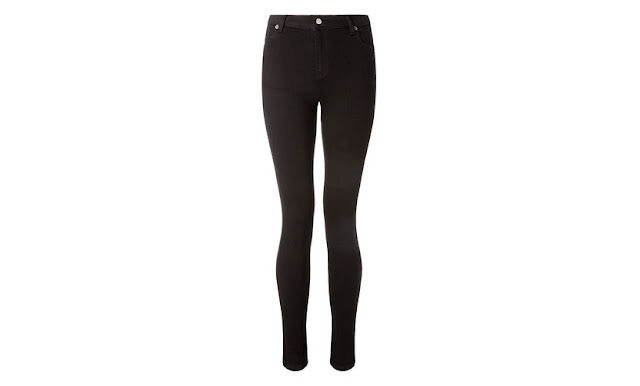 Whistles Black skinny jeans £28.50. I am still massively obsessed with Baukjen and have been waiting patiently for these bad boy foldover leggings to go into the sale - alas they have eluded me. The blue marl colour has been reduced from £55 to £38 which is tempting, but I can't help but think that blue wouldn't be very slimming, which kind of means that the whole foldover concept is a bit lost in translation. I know what I mean. Foldover Leggings £55. 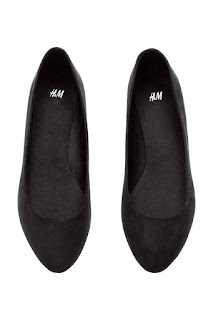 I talked earlier about H & M and I was able to complete my annual trip there to get some ballet pumps for Summer. Since I have enormous feet, I have to get in there early to make sure these don't sell out - which they always do. However this year, I have found them a bit smaller than other years. Maybe my mammoth feet have grown yet again?! I bought mole and black in 7.5 as that seemed to be the biggest size in store - however now I look at the website I can see they are also available in a size 8? Maybe that's where I'm going wrong. Anyway, I will keep shoving my enormous feet into them until they "give" a bit. H&M Ballet Pumps £7.99. I am on the look out for some really comfy and warm pyjamas - since I spend so much time in them. If anyone spots any - please let me know!